Now that winter has just about settled in, we’re hunkered down for a cozy routine of knitting warm things just about every evening. We’ve been knitting for a long time, but sometimes we liked to go back to the basic garments we first learned on, just to enjoy the process of making stitches and neat patterns. That’s why we’ve been obsessed with knitted scarves lately! Just in case you love the idea of knitting scarves this winter just as much as we do, if not more, here are some of our favourite scarf patterns from all around the Internet. 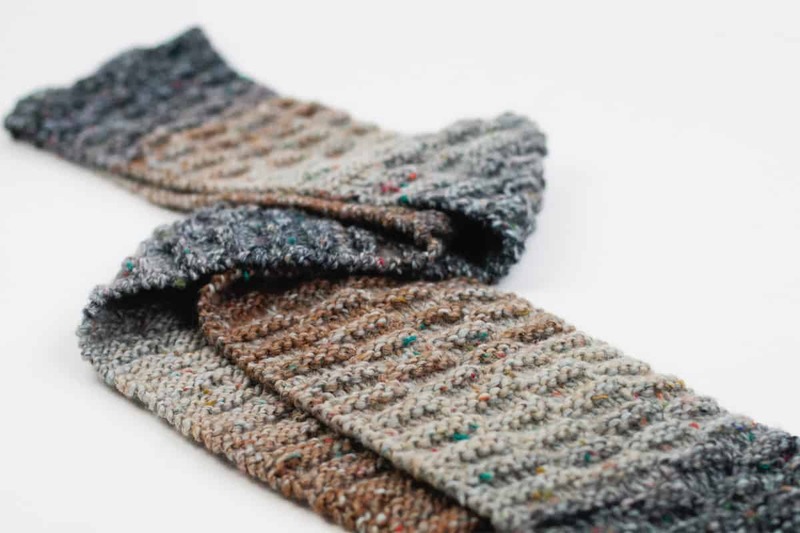 Have you been longing to knit a simple scarf that’s warm, fit for nice variegated yarn, and that has some texture but still keeps it nice and easy? Then we think you’ll enjoy the way this scarf from Canadian Living varies in exciting notches but only uses simple knit and purl combinations, making it a quick but fun option! We’ve always loved detailed stitching patterns that let us create a nice, neat stockinette looking aesthetic but have some kind of unique variation that adds a little more personality. 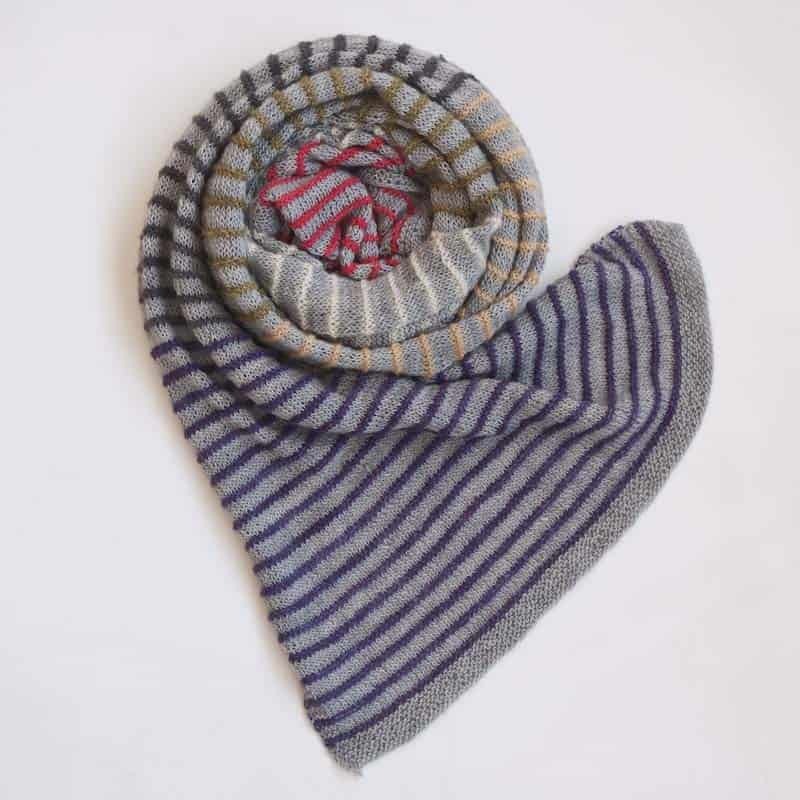 We’re sure you can imagine, then, how much we love the diagonal lines featured on this fantastic scarf from Margarete Dolff! 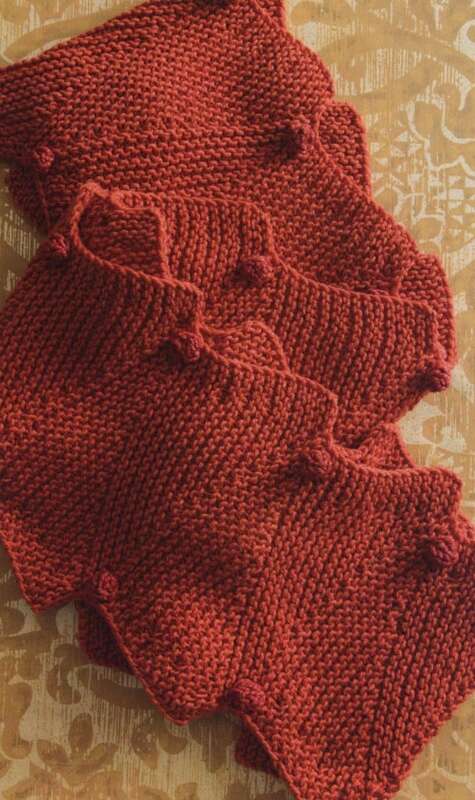 Just in case you’re down for the idea of knitting a simple scarf but you’d still like to work on some kind of project that has direction changing or detailing, here’s an awesome pattern that has just what you’re looking for! 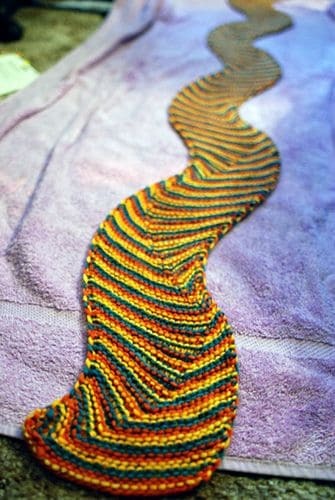 We love the way Leethal made this back and forth garter stitch scarf that looks like a series of zig-zags! 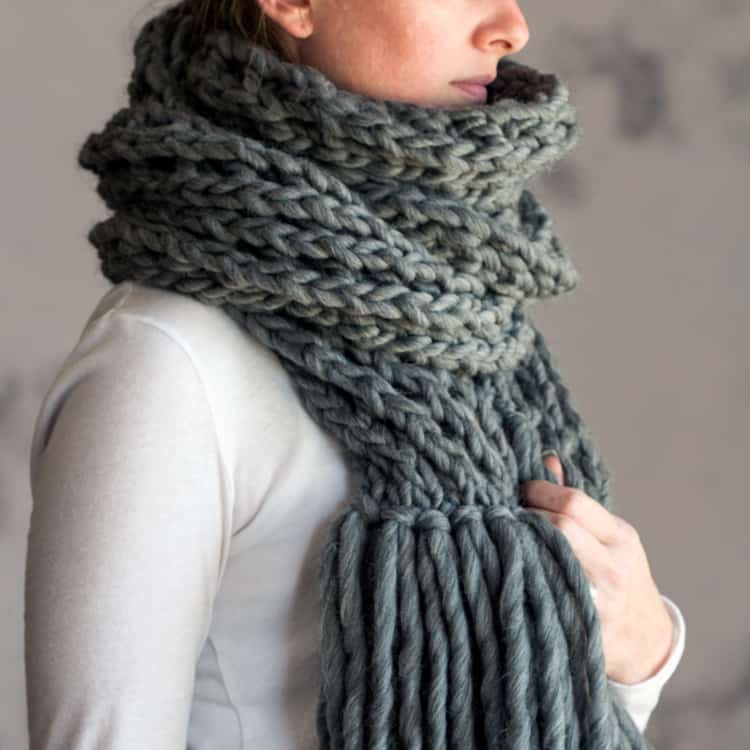 Just in case you’ve been scrolling through our list hoping to find something that’s a little thicker because that’s your favourite kind of scarf to knit with, here’s a fantastic chunky pattern that’s beyond cozy and knits up quick! Get the full instructions from Brome Fields. Are you a much more advanced knitter than some of these patterns call for and, even though scarves are quite simple all round, you’d still like to do one that’s a bit more challenging? 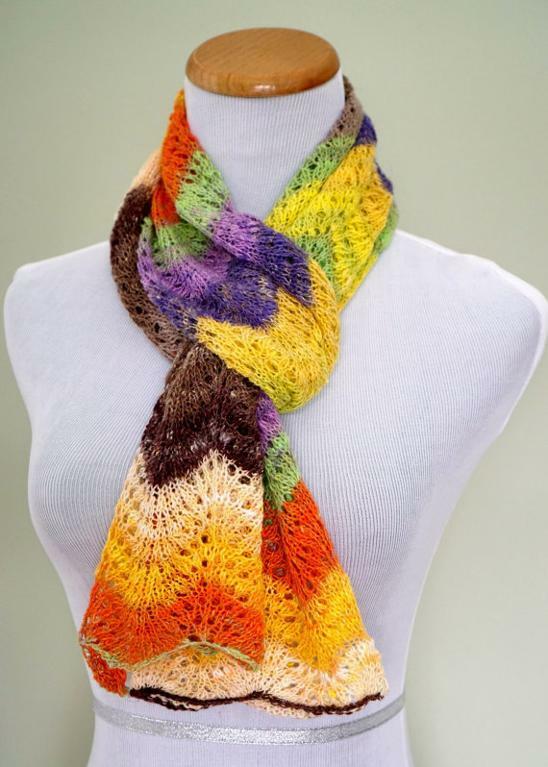 Then you just might be the perfect person to give this absolutely stunning dual coloured brioche scarf a try! 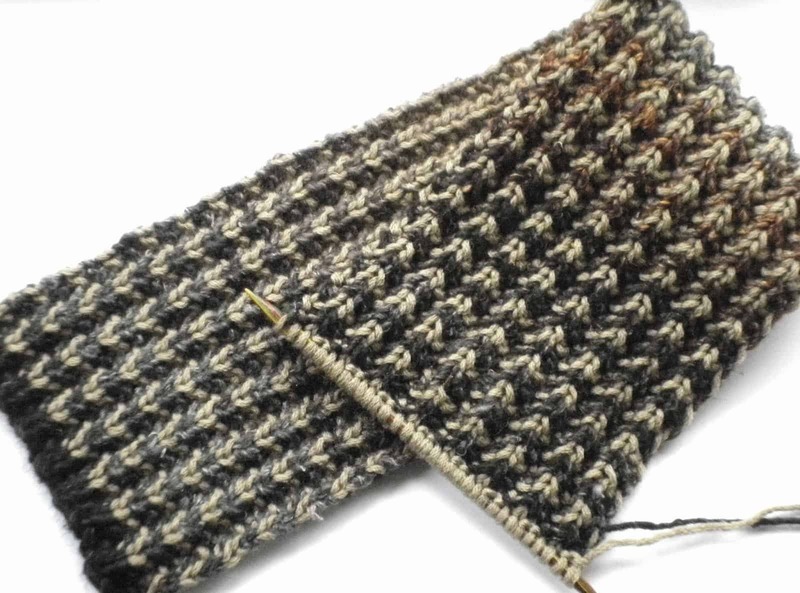 Find out how it’s done in more detail on Happy Knitter. Maybe you’ve been hoping to find a chunkier scarf with a slightly more structured stitch so that it looks more masculine? Well, we find regular double knit or brioche stitch good for that and The Wool Nest agrees! It’s like an extra squishy ribbing that will keep you even warmer than usual. Have you been intrigued so far by all these scarves with varying directions but you just haven’t seen the one that has quite as much personality as you’d please yet? Then we’d definitely suggest taking a look at how Leethal made this fantastically rainbow coloured waving chevrons scarf that will catch anyone’s eye! If your goal is to knit something neat and tidy that looks just like you might have bought it in a store, then we think we’ve finally found the pattern for you! 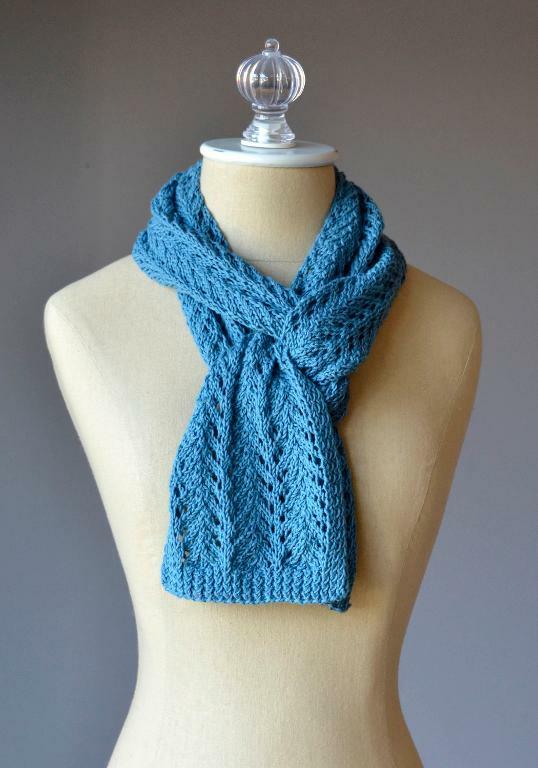 Check out how Cowgirl Blues made this wonderfully thinly striped scarf that’s made in a much lighter weight of yarn than most of the options we’ve shown you above. Besides the hilarious name, the thing we love most about this awesome scarf is the impressive cable right down the middle! Tricoteuse de Nord shows you how simple it actually is to make happen despite the intricate nature of how it looks. 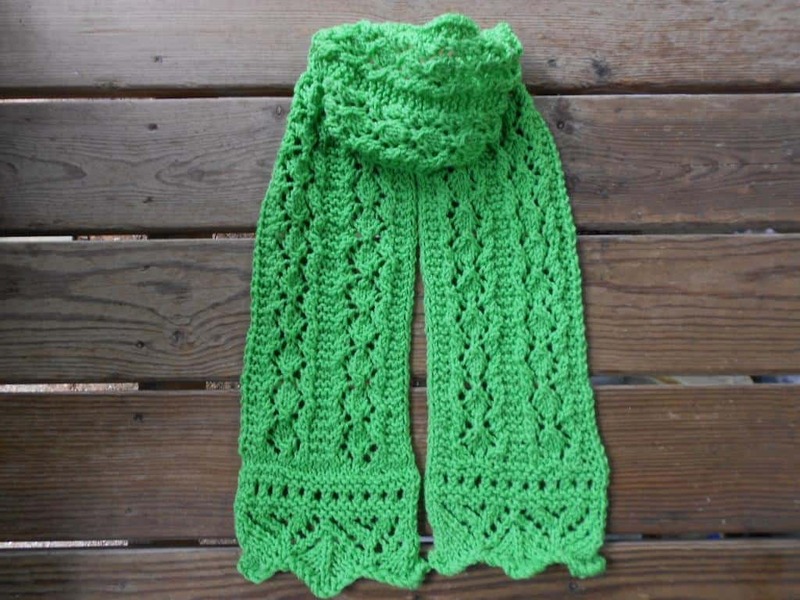 Just in case you live in a place with milder weather, so you can afford to wear lighter scarves without getting too cold, here’s a pattern made with thin yarn and some surprisingly simple lace knit stitches! 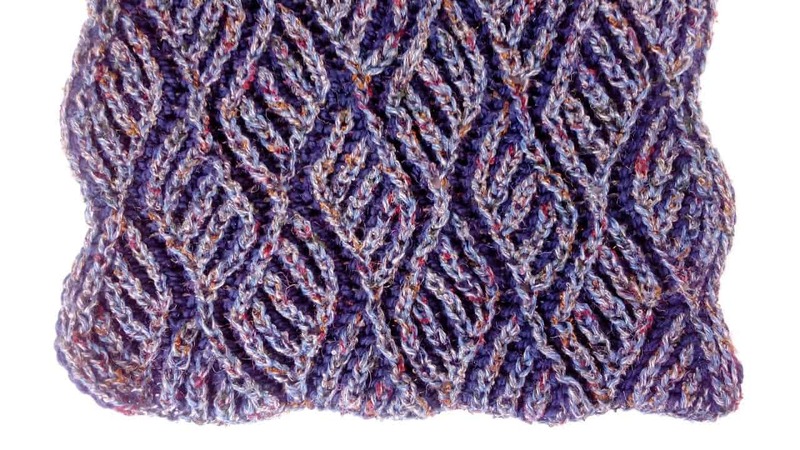 Universal Yarn‘s neat, concise way of laying the pattern out makes it less intimidating than you might think. Just in case you loved the idea of knitting a lace scarf but you’re not sure you’d like to go quite that light in terms of your lace weight, here’s another option that we really love the look of as well, even for slightly colder weather than what we described above! See how this lovely lace repeat is done on Merry Melody Designs. Are you actually still thinking about how much you loved the idea of brioche scarves like we showed you before but you’re convinced you’d like to try dual colour even though the weaving leaves idea we showcased is still a bit too intimidating? Then here’s a simpler pattern from Sapphire Shawl that will let you do regular double knit but with two colours this time. 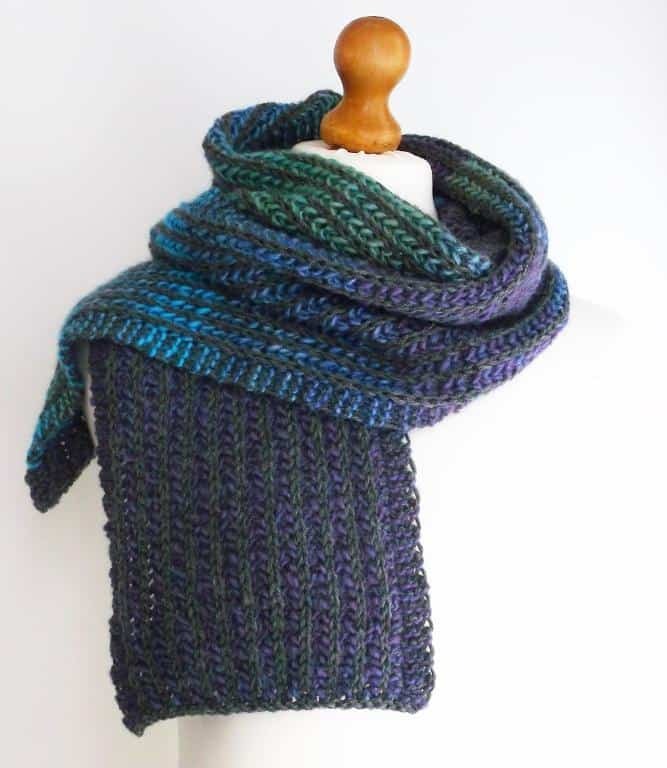 Do you love the idea of making a scarf in a lighter weight of yarn but you think you’d also like to add length to make up for it? We love that idea too because then you’ve got more to wrap around and around if suddenly winds do pick up! 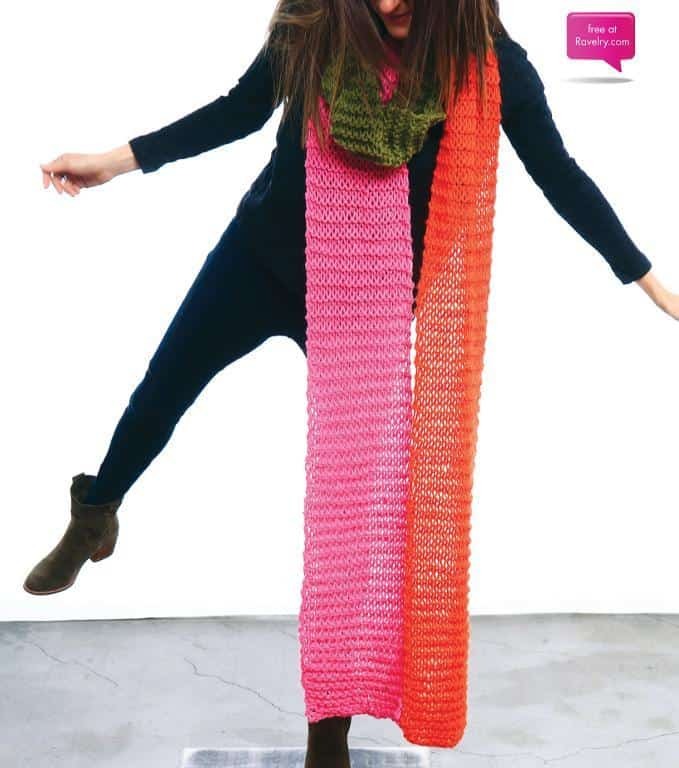 Get the details for making this extra fun scarf on Be Sweet. Perhaps you’ve been scrolling through this list hoping to find something with an extra unique structure that would make a nice, fashionable gift but you need to have it done quite quickly so you don’t miss the occasion? In that case, we’d definitely suggest taking a look at how Nita B. 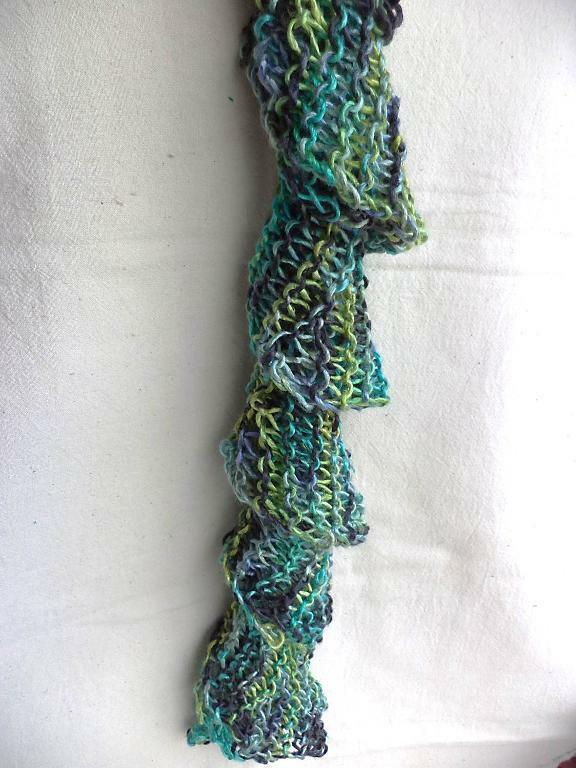 & Nisha N. Inc knit this spiralling scarf that looks like a lovely string of ruffles! If you’re going to start working towards lace patterns but you’re still a bit new to the idea, why not start with a classic repeat that you’ll encounter a lot so you have the hang of it by the time you tackle a more complicated design? Faberie guides you step by step through the process of making a feather and fan scarf that looks very impressive indeed once you’ve cast off. Do you have another favourite knitted scarf pattern that you loved making and adore wearing, or that made a fantastic gift for a loved one, but that you don’t see here on our list? 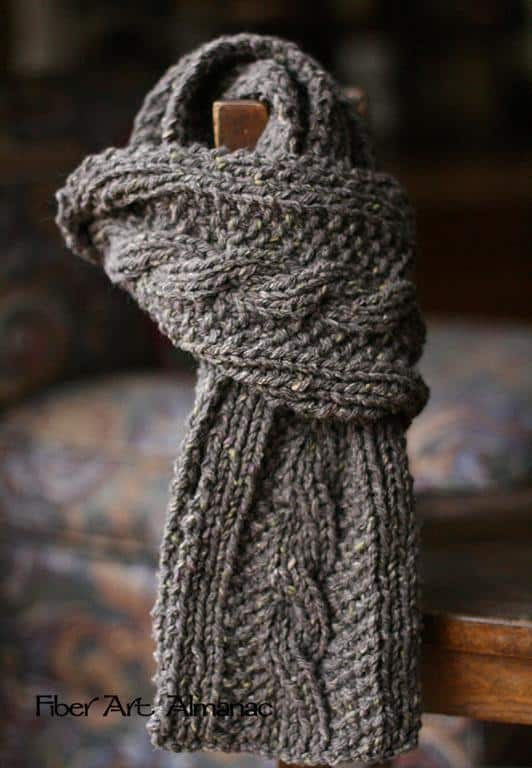 Link us to the pattern so we can see it too or show us your finished scarf in the comments section!